Put beef, stock, tamari, sweetener, sesame oil, sriracha sauce and garlic in the slow cooker. Cook on high for four hours. Add the broccoli and cook on high for 30 minutes, until the broccoli is tender. Season to taste. Serve with green onions and sesame seeds. Can serve with cauliflower rice as a side. Lately I have been on a fish kick. Rarely am I in one of the cities to get fresh fish so fortunately the local stores have a decent selection of frozen fish and shrimp. I have not tasted honest to goodness Cioppino so I hope my version is close. I will post a photo the next time I make this. The stew went too fast to get a photo! Heat the butter in a large soup pot over medium heat. Add onions and sauté until tender but not brown, about 3 minutes. Add garlic and cook for about 2 minutes. Add the wine and increase the heat to high. Boil until the wine is reduced in half, about 4 minutes. Reduce heat. Add tomatoes, tomato paste, clam juice, celery, 1 tsp salt, pepper flakes and Italian Seasoning. Bring to boil and reduce to simmer. Cook for 25 minutes. Add the White fish and remaining salt and cook for 10 minutes. Add clams/mussels, scallops and shrimp. Cook for about 6 minutes. Can garnish with chives or parsley. Pairs very well with garlic bread or focaccia. 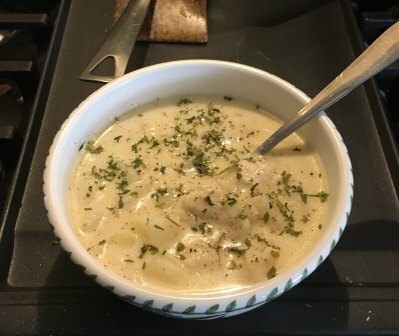 I just had a craving for fish chowder this week. Not exactly lo carb with the potatoes but it is very good! Melt ¼ cup butter over medium heat in a Dutch Oven. Saute the onions until tender but do not brown them. Add potatoes, salt, pepper and water. Top with the fish. Bring to boil, reduce to simmer and cook covered for 30 minutes or until the potatoes are tender. Add milk and evaporated milk and remaining butter. Heat but do not boil. Salt and pepper to taste. Serve garnished with chives or parsley. Pairs well with crusty bread. This recipe was originally Swirled Pumpkin and Cream Cheese Tart from the most recent issue of “Victoria” magazine. I made it twice as pumpkin, amazing flavor, but I wanted to use some of the native persimmons from my trees in the pasture. They are ripe right now and the trees are full. This year looks like a bumper crop. There are definitely enough for me, the deer and the coyotes. If you don’t like or don’t have access to native persimmons, the original version of this is wonderful. It pairs well with coffee(pumpkin spice anyone?) or fresh brewed hot tea. 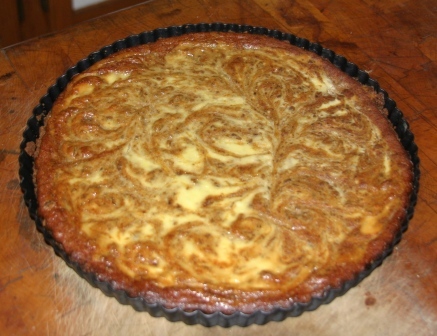 You will need a 10 or 11 inch tart pan with a removable bottom for this recipe. Crust – In a large bowl, stir together the ground cookies, walnuts, brown sugar and cinnamon. Add melted butter, stirring to combine. Press mixture into the bottom and sides of the tart pan. Bake for 12 minutes and set aside to cool. It works best if the crust is cool. Don’t skip this step. Pumpkin Filling – In a separate large bowl whisk togetherpersimmon/pumpkin, sugar, eggs,egg yolk, spice and vanilla extract. Add cream, whisking until smooth. Pour into cooled crust. Cream Cheese Swirl – In a medium bowl, beat cream cheese and sugar with a mixer on medium speed until creamy and smooth. Add egg yolk. Beat until smooth. Drop the cream cheese mix into the persimmon/pumpkin mixture by the teaspoon full. Gently swirl the mixture with a butter knife. Bake until center is set, about 35 to 40 minutes. Let cool completely. Cover and refrigerate for at least 4 hours before serving. Serve with ice cream or whipped cream. Fall is here is Oklahoma and I am loving it. The weather is cooler and a little rainy. 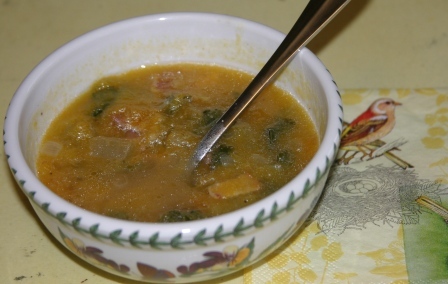 Perfect time for Autumn soups. 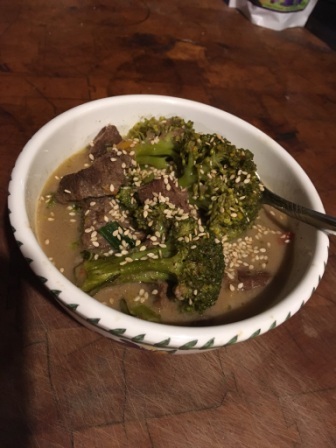 This recipe is not low carb as are some of my recent ones. Sometime you just have to say, what the heck and go for some great soup. I found this recipe on Martha Stewart’s site. I always change things up for my taste. I roasted my acorn squash fresh versus using frozen. It took longer, but the sweet roasted flavor was there! I also added more bacon because….. well because I love bacon. LOL. I used fresh garden kale, (yup mine is growing) with blanched kale from the freezer. This weekend was cook from the fridge and freezer. Recently I ordered a half side of beef from my local butcher. They raise their own. It will be ready in mid-December, and now I must get another deep freezer. I planned this for years and finally everything fell into place for me. Well, enjoy this recipe! Cook bacon in a large sauce pot over medium heat until crisp about 5 to 6 minutes.Using a slotted spoon, transfer bacon to a paper towel lined plate. Set aside. Add onion to bacon fat in pot cook until translucent about 5 minutes. Add kale and cook until softened, about 4 minutes. Add half of the bacon pieces. Add squash puree and 3 cups of water or chicken broth. And more to desired consistency. Season to taste. Bring to a boil and reduce to a low simmer for about 15 minutes. Garnish bowls with remaining bacon and serve with biscuits or bread if desired. Earlier t his week I was watching OETA Create. It’s the PBS station in Oklahoma. Anyway, Nick Stellino’s cooking show featured a shrimp, pepper and asparagus ragu. Now it so happens that asparagus is popping up in my garden. Oh so good. After I came home from my errands today, my planned dinner was this shrimp ragu. And it was yummy! I had some day old bread and I made garlic bread. Up ‘til that point it was fairly lo-carb, but there are times when you just have to go for it! I hope you enjoy this as much as I did. Heat the EVOO in a cast iron skillet over medium heat. Add bacon and cook until it starts to brown. Add garlic and asparagus and cook about 4 minutes. Add red pepper, stir and cook for about 2 minutes. 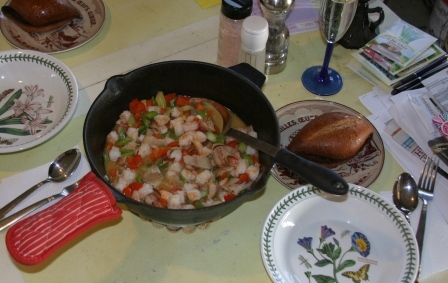 Add shrimp and cook about 3 minutes. Add wine to the skillet and stir until it reduces by half. About 4 minutes. Add butter. Stir until it melts. Season to taste. You can serve this with garlic bread that you were cooking while the ragu was on the stove.